Acne is usually a temporary problem, but acne scars can be permanent. However unwelcome they may be, scars are part of the skin’s normal healing process after it has been damaged by a wound or injury. Damage to the dermis is what causes scarring to form on the skin. Inflamed blemishes occur when the pore, or follicle becomes filled with excess oil, dead skin cells, and bacteria. The pore swells, causing a break in the follicle wall. If the rupture occurs near the skin’s surface, the lesion is usually minor and heals quickly. More serious lesions arise when there is a deep break in the follicle wall. The infected material spills out into the dermis and destroys healthy skin tissue. To repair the damage done to the dermis, the skin forms new collagen fibers. Collagen is the protein that gives the skin plumpness, strength and flexibility. Unfortunately, the finished “repair job” never looks as smooth and flawless as before the injury. 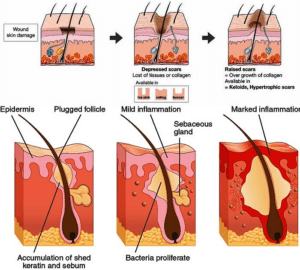 Inflammation is the single greatest cause of scar development. The greater the inflammation on the skin, the more likely scarring is to occur. Deep breakouts that take a long time to heal also increase the chance of scarring. Treatment at the first sign of inflammation is key to prevent acne scars. Treat Acne As Soon As It Develops: The best thing you can do is get acne under control as soon as possible. Visit us immediately if your acne isn’t getting any better with facials, lasers and our effective acne line. Treatment at the first sign helps to keep breakouts to a minimum and prevents acne from developing into a more severe form. Acne prevention minimizes the chance of scarring. Don’t Squeeze, Pop, or Pick at Pimples: Pass up the temptation to pick or squeeze a pimple.Squeezing forces bacteria deeper into the dermis, spreading an infection to other tissue and creating more inflammation. Remind yourself that popping pimples can extend the healing time and ups the chance of it leaving a permanent scar. Allow the blemish to heal on its own. If you’ve already picked at a blemish, take steps to heal it and don’t pick at the scabs. If you get large, deep nodular breakouts or acne cysts, those are more likely to destroy skin tissue and leave scars. Over-the-counter acne products just won’t help these types of breakouts. Get an appointment with our dermatology clinic. Understanding the types of acne scars is crucial for delivering satisfactory results. A combination protocol is essential for best results ranging from chemical peels, Bellafill, and laser treatments.